We’ve often discussed Nordost in terms of a complete, systemic, and systematic approach to audio, but that message sometimes gets lost against the company’s complete, systemic, and systematic approach to cables and power. In fact, the operative word is ‘complete’; ideally, every aspect of the system is taken under the Nordost wing. Put simply, the ‘Sort’ line is the company’s way of addressing what the cables and power products do to the system on the inside to the mechanical parts of the system on the outside, and with the addition of the Sort Lift, this whole process is complete. We’ve touched upon the Sort Kones before (way back in Issue 73), when Chris Thomas looked at the four different flavours of Sort Kone. These are – in ascending order of price – all aluminium (AS), aluminium with ceramic ball (AC), bronze and ceramic (BC), and Titanium with ceramic (TC). All act as a vibration drain, with a mechanical diode effect to prevent external vibration from travelling up through the Sort Kones. You need at least three per device, and they are strategically placed on the underside of devices (beneath the transformer, power supply, or CD player are three of the most important aspects). You can – and, in many cases, should – use the feet in different permutations (AS often sounds best used on its own, but a lone AC with a pair of BC models often sounds better than a trio of BC), and in some respects simply ‘going for it’ with the most expensive TC Kones will not necessarily return a better sound unless the equipment that sits upon them is up for the challenge. 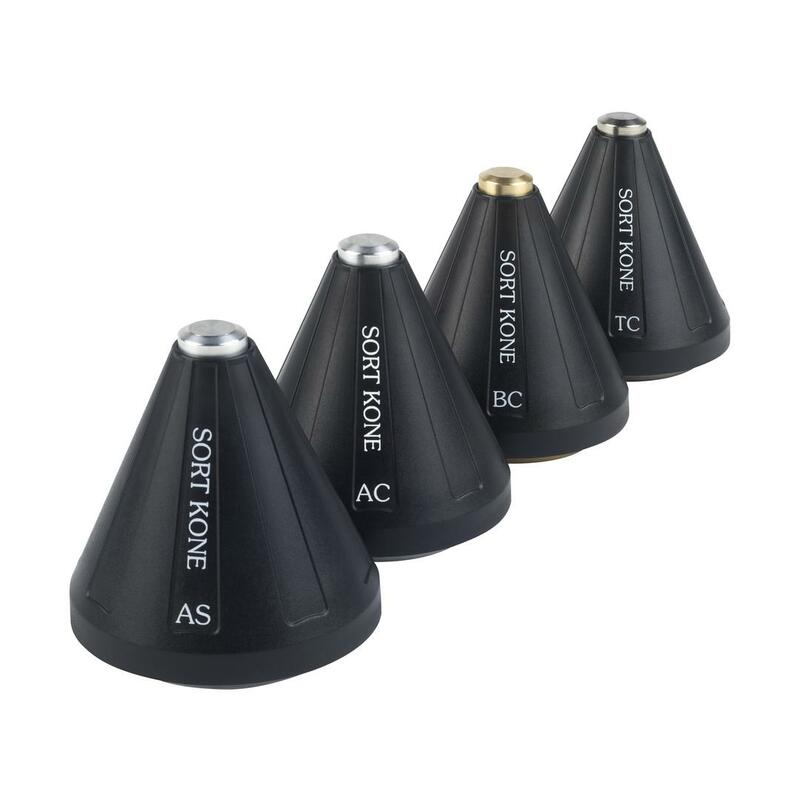 Admittedly, the price of three or more TC cones makes them self-selecting in terms of equipment they are likely used with, but if the TC represents icing on the Sort Kones cake, the quality of equipment recommended means it needs to be really damn good cake! Unlike the Kones, there is only one Füt option, with a series of threads designed to fit the Füt with the widest range of speakers and racks. Once again, the idea is effectively a vibrational mechanical diode, but this time the Füt’s aluminium and bronze case is met with a trio of ceramic balls (in place of the single ceramic ball used in each Sort Kone), raising the height of the loudspeaker by about 70mm in the process. Absolutely precise levelling and positioning is a must here, and the premium pack comes with (literally) laser-guided precision, thanks to a laser measurement system. There are optional Kups for those who prefer not to scratch a floor and Locks to ensure the Füts (Fëët?) don’t drift. As a gift to the writer, if you are guilty of either not getting the speakers precisely level, or don’t lock the Füt down enough to prevent them drifting even slightly out of true, the most obvious effect is in the temporal domain, which means George Michael wasn’t lying after all… guilty Füt have got no rhythm! Now, there is Sort Lift, which applies the same ideas to loudspeaker cables. Sort of. It might seem obvious, but the issue with cables – especially Nordost cables – is they aren’t loudspeakers or amplifiers. A cable doesn’t weigh as much as an amplifier sitting on a trio of Sort Kones. An amp is putting enough weight on each of the support systems that they engage appropriately, but the mass of a short run of Nordost cable between two Sort Lifts is not enough to use the same technology. Instead, the Sort Lift is a game of two halves: the base, and the springs. The base is a stable, anodised, aluminium disk, designed to inhibit any transference of electrical charge from the floor to the cable and eliminate static build-up on the dielectric itself. This base supports the proprietary Floating Spring System. The Floating Spring System uses a flexible, titanium alloy spring-wire, which makes up both the support wings and tension wire supports. In both elements, the alloy wire is coated in FEP, mirroring the design of Nordost cables and making the supports an extension of the cable jacket, eliminating any electrical interference, while allowing the cables to maintain their natural resonance properties.